Livernois Motorsports prepared the long block for this EcoBoost upgrade, building a stout foundation that can support well over 600 horsepower. 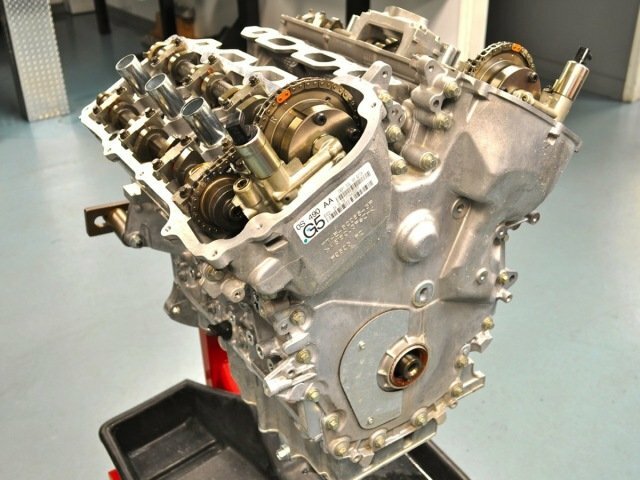 The Ford 3.5-liter EcoBoost V6 is still relatively young on the aftermarket yardstick, so late-model tuners are often compelled to develop products in-house to go along with tuning and blueprinting tricks learned through testing and experience. Livernois Motorsports has developed a solid performance strategy for the EcoBoost that focuses on durability improvements, advanced tuning, and fuel enhancement, to complement larger turbos and more boost. The result is an EcoBoost build that produces more than 600 hp to the four wheels of a Taurus SHO. Given the stock output is 365 horsepower with 350 lb-ft peak torque, that’s quite a power increase, especially considering the factory setup has one big hurdle for performance tuners to challenge. The EcoBoost was designed with direct injection, which relies on a mechanical fuel pump integrated into the engine. Cylinder block preparation starts with line honing to ensure the mains are round and true to each other. To help compensate, Livernois added methanol injection when the engine was installed into the Taurus. This is a stand-alone fuel upgrade that pumps high-octane methanol into the intake under full boost and wide-open-throttle to add needed fuel when the DI system is maxed out. Basically, the kit consists of a remote reservoir for the fuel, an electric pump, a controller and a spray nozzle that is mounted in the intake system. “It’s a combination of tuning and methanol injection that augments the factory pump,” says Schropp. The EcoBoost block is an open-deck design. Livernois machines the deck to accept a billet plate to stiffen the block. Coolant passages are then machined and drilled into the insert. 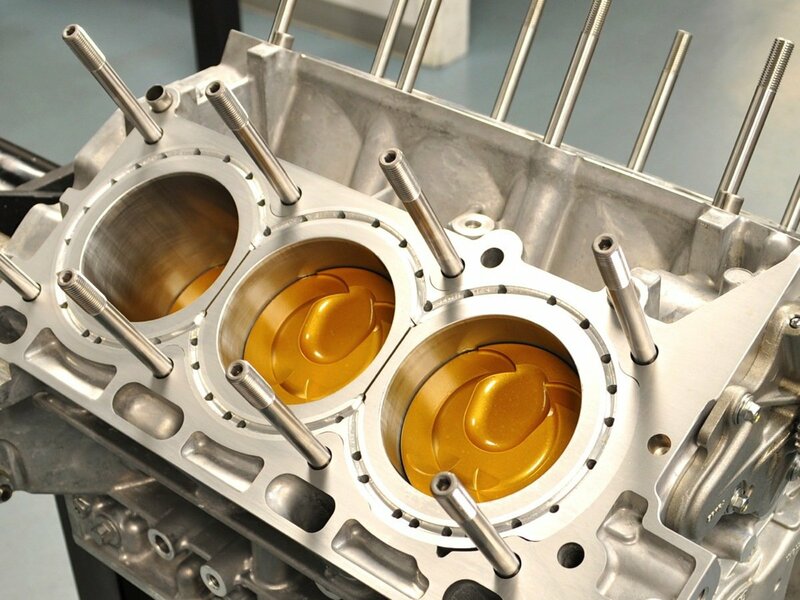 While the bigger turbos and tuning increase the power, Livernois’ cylinder block prep work and component upgrades provide the durability needed to support the increased cylinder pressures and higher RPM. Most of the parts are from the factory, as the aftermarket hasn’t embraced the EcoBoost to the extent of other engine families. “We focus on fortifying the foundation of the engine to make sure it can support those kinds of numbers,” adds Schropp. Early machine work includes align-honing the mains to ensure main clearances and that the bores and round and true to each other. Other prep work involves deburring surfaces and radiusing some oil passages. Reinforcing the block is achieved with a trick deck plate that is pressed into the stock block. The EcoBoost features an open-deck design where the spaces between cylinder bores and water jackets are left open. Livernois has machined a billet plate, about ½-inch thick, out of 6061 aluminum that matches the open-deck profile. The block is then machined to accept the plate with exact tolerances for the press-fit installation. Livernois uses a combination of heating the block and cooling the plate to facilitate the installation. Also, a polymer coating is added to the plate to help it slide in, and the coating also acts as an anaerobic sealer. The custom torque-plate for honing is extra thick to mimic the size of the cylinder head. Once the deck plate is installed, it is surfaced and then machined to provide coolant passages. Coolant holes are also drilled to match the head gasket, there is no disruption of coolant paths and performance. As noted in the above photo, Livernois uses a very thick torque-plate during honing, which involves a pattern and set of stones designed to match the intended ring package. Livernois uses proprietary main and head studs in the engine. The crankshaft is stock with a mild oiling improvement. The stock stud girdle and oil pan complete the bottom-end assembly. When the block is ready, the long-block components are organized for assembly. Livernois retains the stock crankshaft but adds its proprietary rod-piston combination. Here’s the assembly room at Livernois. The pistons are custom made to Livernois specs for use in a turbo engine. Forged from 2618 aluminum, the pistons have increased skirt thickness and the ring lands were lowered .320-inch below the crown to increase the strength of the piston deck. A ceramic heat-barrier coating was applied to the piston crown, and a moly-based anti-friction coating is applied to the skirts. The 1.5/1.5/3.0 ring package features a steel top ring and Napier second. Finally, the piston-pin wall thickness is increased. Livernois has a custom rod-piston combo made for the EcoBoost V6. Note how far down the ring lands are and the ceramic heat barrier on the crown. Right photo shows the coated bearings and ARP 2000 bolts. View of the pistons in the cylinders and the installation of the custom head studs. The I-beam connecting rod is forged from 4340 steel and fitted with ARP 2000 3/8-inch bolts. “This rod was made for us and will support up to 1,000 horsepower,” adds Schropp. 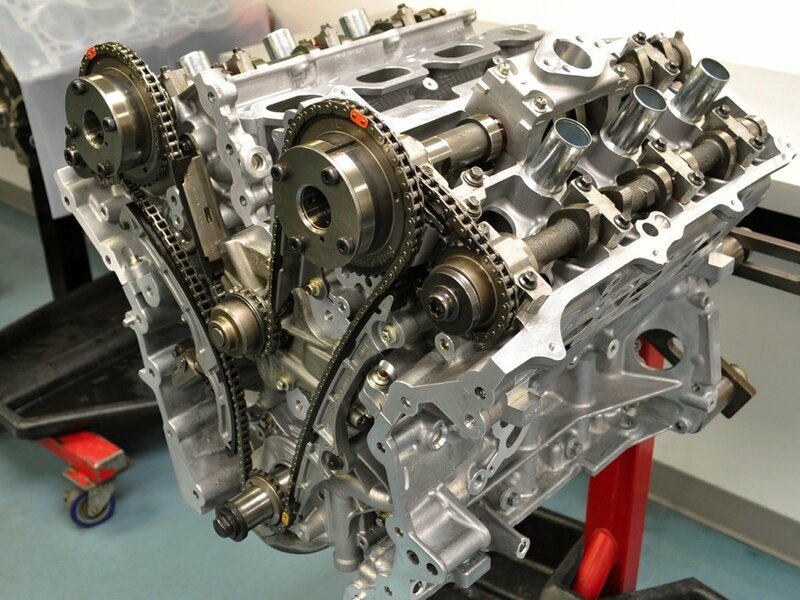 Livernois retains the stock timing chains and camshafts but beefs up the supports for the guides. Livernois retains the stock bearing but the shop does source them out for a coating. Overall the rod-piston package is just shy of 1,000 grams. “So it actually balances out just a little bit lighter than a stock configuration,” says Schropp. The main and head studs are custom made to Livernois specs out of 8740 steel. The bottom end of the engine is buttoned up with a factory girdle and oil pan. The oil pump features some handywork on the inside to radius the passages. The gears are also surface treated for added strength. Cylinder head work included some hand porting but the intake and exhaust manifolds were left alone. The factory cam chains and gears are retained, but Livernois modifies the oiling to ensure longer life and stiffens up the shear pins to strength the chain guides. The cam phasers and camshafts are also carry over from the base SHO engine. Providing the additional boost is a pair of larger ATP turbos. The stock turbochargers have a 40mm wheel inducer and 34.5mm wheel exducer on the turbine side and 36.3mm inducer and 49mm exducer on the compressor side. The ATP Garrett upgrades measure 50mm and 43.5mm, respectively, on the turbine and 43.4mm and 56mm on the compressor. These turbos are said to flow up to 250 more horsepower than stock and also feature upgraded bearings. ATP does customize these turbos to meet Livernois specs, such as altering the wastegates to meet the shop’s needs. Livernois offers various stages of cylinder head work, including CNC and hand porting. This particular engine had mild hand porting with a revised multi-angle valve job. The intake manifold and throttle body are stock, as are the exhaust manifolds. Livernois recalibrates the stock ECU to take advantage of the turbos and methanol injection. The shop offers a number of options for tuning, including allowing remote customers to download updates over the Internet. Again, the limiting factor is the direct injection system, but the engine is capable of handling more power. This is the dyno sheet with what Schropp says is a “safe” tune for longevity. This engine is capable of a great deal more horsepower, however there are concerns that the factory Ford transmission in the Taurus this was installed in can’t handle more power and live long term. 600 hp at the crank puts the SHO squarely into the same category as some of the world’s most exclusive luxury sedans. It also makes it a quietly menacing threat on the street, or any track, giving the SHO a truly sleeper quality. Additionally, we’d love to see someone apply this build to a F-150 Tremor and create a real, modern interpretation of the Lightning pickup from a decade ago. Regardless of the application, Livernois is proving that the 3.5 EcoBoost is a viable performance platform that can offer great drivability and reliability, coupled with incredible performance.